Small - $88.99 Only 2 left! Let's see here. Your suit is super fine. You've got the shirt with the long lapels and the suit coat that looks divine. When you put on such such gnarly threads, you look ready to wear a hole in that dance floor. But an amazing suit isn't enough, Daddio. You need to get yourself a solid pair of kicks to go with those amazing threads, and no simple sneaker will do. 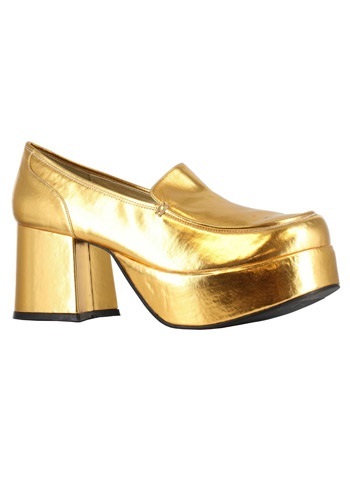 Check out our Gold Daddio Pimp Shoes. These babies are gold colored with three-inch platform heels that will make sure you stand out in a crowd and take home that disco trophy you've been eyeing up. The metallic finish of these heels will look ultra groovy under the disco ball while you wow them with your special version of The Funky Chicken. Get yourself a pair of these, maybe some killer chains and shades, and you'll be the hottest thing on the dance floor, fo' sho.